Celebrate all occasion with this Litecubes in your drink. 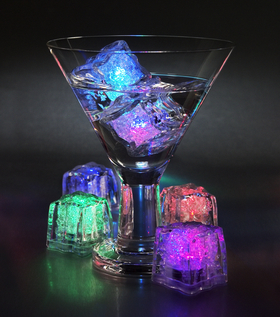 An ice cube that never melts but instead lights up in different colors; made from an FDA approved, non toxic plastic with a gel that froze to aid keep the drink cold. Just turn on the LiteCube then drop it in your beverage, punch bowl or cocktail and you will enjoy the soothing coldness of your drink. For only £7.99 you can enjoy a cool drink even when power is not available.